Thank-you to Ann Beech who gave us a reading and a song. 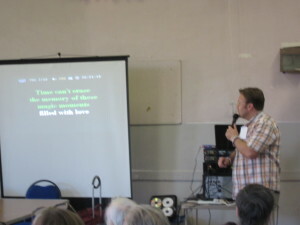 Thank-you to Gideon Bull for his Karaoke sing along. It was a good occasion to relax sing and dance! Entrance behind W7 bus stop on Park Road Buses W3 144 W7 stop nearby – W5 a short distance away. At the A.G.M we shall need your help to assess our activities during 2014 and prepare for major challenges facing us in 2015. We shall invite a speaker to help inform our discussions on how we should respond to the many severe cuts in local services. 3. Reports from Officers: Meetings, Finance, Membership & Distribution, Social events, Publicity, Campaigns. 4. Election of Officers & committee. Panel of Chairs: Ann Anderson, Lauritz Hansen-Bay, Yvonne Bonnamy. 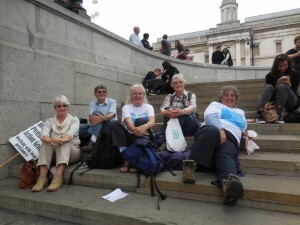 Committee: Ann, Janet, Pamela, Yvonne, Clive, Lauritz, Celia, Sylvia, Barbara. Delegates Greater London Region National Pensioners Convention: Janet Shapiro, Sylvia Roberts. Resolutions: likely to include – provision of home meals, closures of homes & drop-in centres, home care services, library services etc. Members may submit for discussion. Notices & AOB Speaker to be announced. Please come forward if you would like to become more involved. We need more new recruits to the committee. Note annual subscriptions are due – donations welcome! As Lynne Featherstone had just been promoted we were grateful that she kept her promise to see a delegation from HPAG at Portcullis House at 2.15pm for 15 minutes; in fact she allowed us somewhat longer. · To present a copy of the manifesto and ask her response. To this she referred us to the draft Liberal Democrat policy on the website.  · Lynne asked us for more information as to what was wrong with state pensions, and she has been sent a statement. This is given below. Barbara two issues. 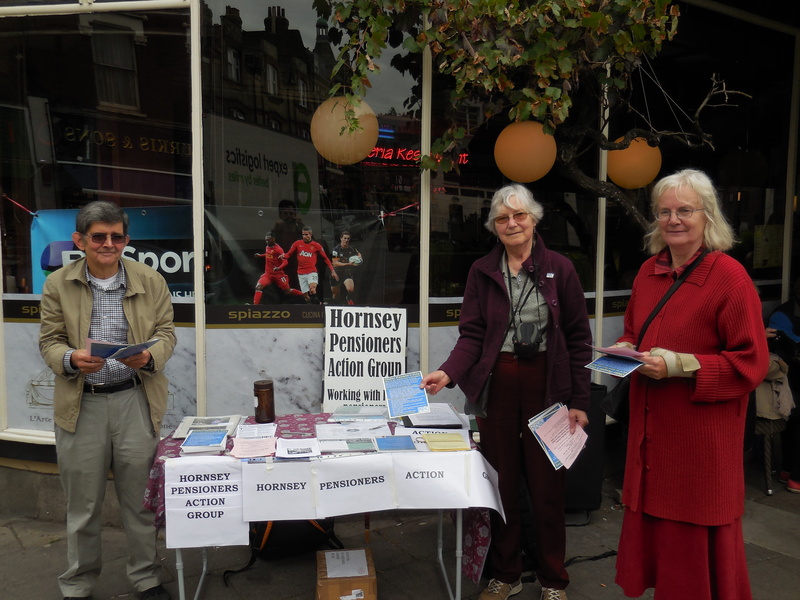 She handed Lynne a report from Haringey Healthwatch ‘GP Access in Tottenham Hale: Capacity Study’, dated September 2014. The report showed, in addition to the acute shortage of GPs in Tottenham Hale, inadequate provision in Noel Park that is part of her constituency. Barbara also raised the unfair way beneficiaries of single parents were treated for Inheritance Tax, and has since received a reply. Lauritz asked Lynne to consider the dangers posed by the Transatlantic Trade & Investment Partnership, that he considered reduced national democracy putting public services at risk. Responses from three parties given at the National Pensioner Convention Rally that was held in Committee Room 14 are given below. Now we must approach local parliamentary candidates to get their responses to the NPC Pensioners’ Manifesto. The November 5th Rally proved to be a successful event, with a good attendance and speakers from the three main political parties who stayed for over an hour to speak and answer questions, while some groups – like ours lobbied their own MPs over the manifesto. 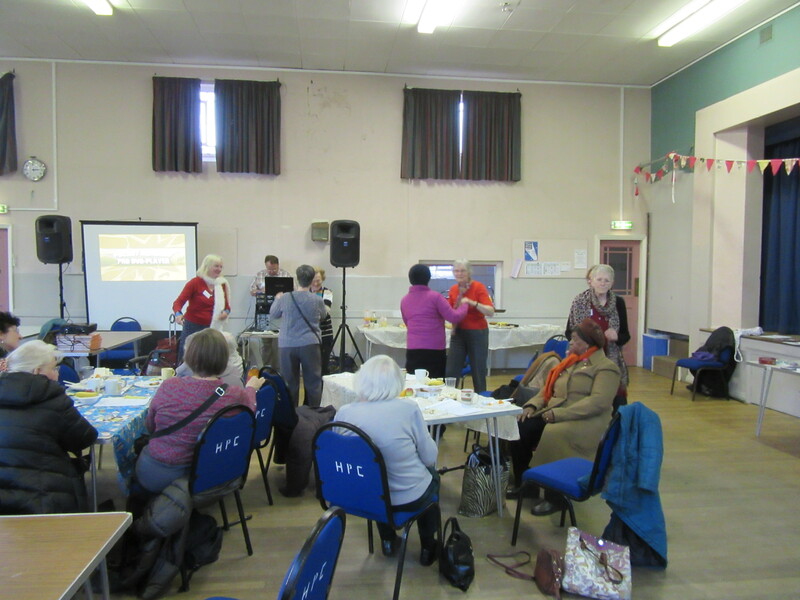 The speakers were Pam Moffatt, Haringey Older People’s Forum and Councillor Kirsten Hearn, Labour Councillor for Stroud Green Ward. 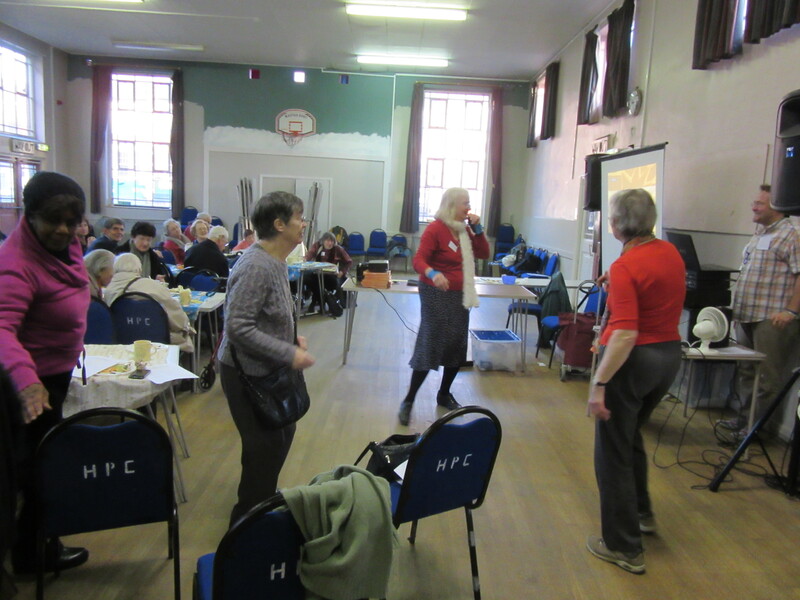 The speakers already knew one another through the Greater London Association for Disabled People (GLAD); Pamela is wheelchair bound, with limited use of her hands, Kirsten is blind. Pam Moffatt explained that her condition was genetic, not the result of a traumatic accident. 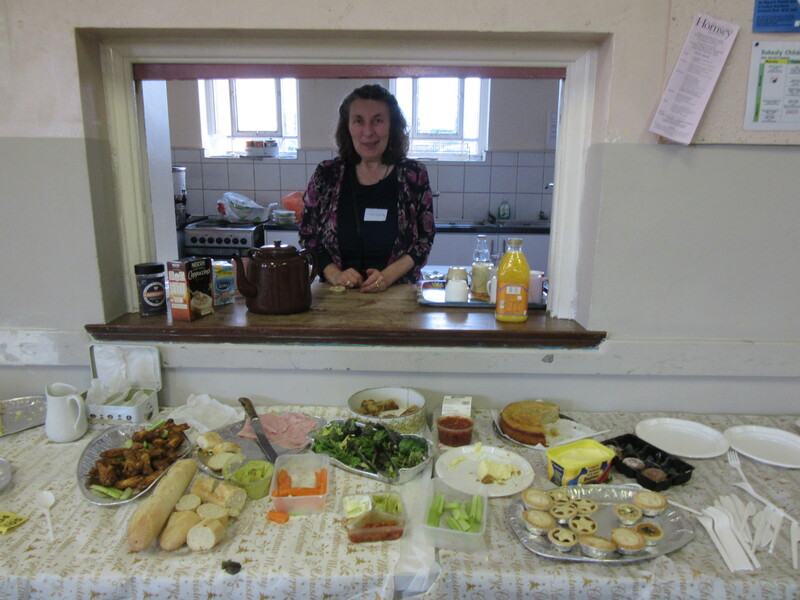 She originally worked as a registered NHS Dietician, but retired early for health reasons. Her disability was progressive; this allowed her to adjust to each loss of function in stages. She remembers feeling devastated at not being to pour a cup of tea, having difficulty getting out of a chair or out of bed. Carers and the various aids were essential. Her father was helpful, but it was her brother who taught her to drive an adapted car. A helpful organisation was found to solve problems. Not having strong arms and hands, wheelchairs needed to be adapted for self-propulsion. The major engineering firm Yamaha was responsible for an early design for the steering. The present design has power on both wheels, but the battery is at the back making it unstable. On one occasion she has tipped backwards while gathering blackberries with her carer on Shepherd’s Hill. Pam cannot engage the brake herself; this poses problems for bus travel. Although TfL caters for wheel-chair access on buses, there are problems, and where conflicts or difficulties arise it is the driver that has to intervene, even though they are not supposed to leave their cab. Modern technology enables her to type and read emails and these skills were needed for her work as a volunteer. With Dragon adaptation to her Apple computer Pam dictates what she wants typed. The layout and size of print can be selected. Such technology helps with leisure, although practical problems arise with theatre visits; there are Fire Brigade regulations and lifts do not always work! Pam loves to read but cannot turn pages. 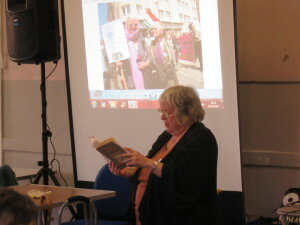 A Kindle on her laptop, using a Westminster mouse enables her to read. Audi books were no good. Pam has certainly not allowed her mobility and health problems get in the way of a career of volunteering and leadership. Then it was Kirsten’s turn and she prepared herself to speak by adjusting her audio player – her note keeper. She explained that she was born partially sighted; lost her sight as a child and attended a special school. She came to view this as social isolation, not as drastic as the Nazi policy of exterminating less than perfect people, but nevertheless discrimination. Her isolation from the community was not her problem and the barriers to full participation had to be broken down. It was at Stoke Mandeville, that Kirsten joined a protest to claim her right to equality – and sat down in the road. Just as black South Africans should have full rights, she felt entitled to the facilities that enable her to have proper employment. Now a local government officer she has earned that right, plus other responsibilities – and of course is an elected councillor. Getting about can also pose problems for a blind person. London has low floor buses at last and Kirsten travels by bus, dodging the tank-like buggies. She uses a fold-up white stick. It is now assumed that blind people can take on the whole range of jobs provided they get the right equipment. Kirsten is computer literate; she uses Text to Speech to read email messages, and has a laptop with speech output that she usually carries about. She also uses a Kindle with supplementary software. AppleMac certainly markets products for accessibility. 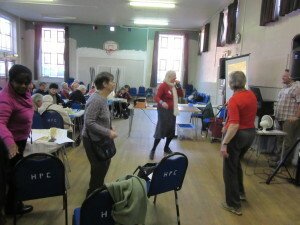 Questions included how older people need gadgets to get on with normal tasks, but Pam said that people should not need to shop for such devices but have them provided. 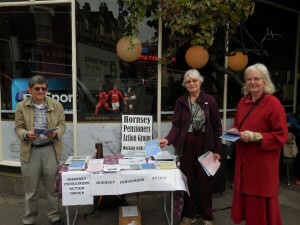 She referred us to the Haringey Cabinet member for the disabled, Cllr. Peter Morton. Pam related a story of ludicrous bureaucracy; after treatment her hospital discharge was only possible with a wheel-chair, but the hospital chair could not be taken out of hospital, and the borough one could not be taken into hospital. Her brother in Scotland had to hire a Red Cross one to get her home. The raffle and refreshments followed. Convention – a regular presence at all events and protests. 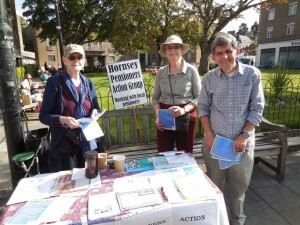 He came to Haringey in the 1950s and was active in the community. Farm when it was a farm and not a housing estate. Both will tell us how they have taken very active roles and how they surmounted barriers to their involvement. The Royal College of GPs tells us that GP services are under pressure due to funding cuts. 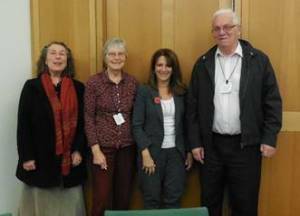 We know that older people depend upon their GPs, so a letter to Lynne Featherstone was passed round for people to sign. It asked her to do her best to get adequate funding for GP services to be restored. Janet reminded the group that Hetty Bower was a founder member of the group and that she died last year at the age of 108. Hetty’s daughters Celia and Margaret invite us to a Celebration of the Life of Hetty Bower to be held on October 3rd 7-9pm at Conway Hall (near Holborn Sation). People were asked if they needed help getting to this event. 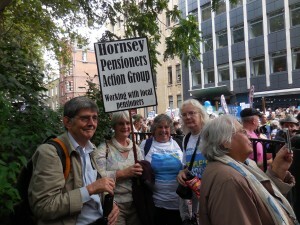 The HPAG banner at Red Lion Square. On September 6th our group was at Red Lion Square, Holborn, to welcome the Darlington Mums who had marched 300 miles to deliver their 999 warning to save the NHS. Two had marched from Edmonton. At Trafalgar Square we had a rest. HPAG celebrated this day by holding a stall on September 27th from 11am at Crouch End near the Town Hall and the W7 bus stop. We told people that we’re an asset not a burden – universal pensioner benefits are important and should not be means-tested. Leaflets that publicise the work of NPC and our group were handed out. September 17th ‘Be Scam Aware! Dale Bevington’ from ‘Home Instead’ gave a comprehensive illustrated presentation and PC Sara Evinson described local cases of fraudulent activity where she assisted the victim. The many stories of the distress caused to victims by fraudsters were alarming and by no means uncommon. The perpetrators are into a profitable business – in the region of £6 million was made by such firms over 2 years. Mass fraud is carried out by post, email or telephone. Dale advised us to how we can guard against fraud. Be suspicious; Microsoft would never ring you, neither would a chief police inspector or your bank. Criminals carrying out telephone fraud will hold onto the line if you ring off and then impersonate whoever you suppose that you ring next. This is where it is handy to have a mobile phone; then you can report the call or check what has been said. There is a Telephone Preference System TPS, whereby you block unsolicited ‘cold calls’, but this only blocks firms registered on TPS. Catalogue and brochure scams lure one into an advantageous offer, without our suspecting that a contract to continue payments was included. Those of us using email are subject to so many ingenious schemes. One is to insert a link that you are encouraged to open. (Janet apologises for strange emails triggered to her address book caused by her clicking on one such link.) The fraudster wants to unlock one’s address book and spew out messages impersonating a friend in distress. Because this is done on a large scale some acquaintances will send money. Phishing schemes use an email to present you with an attached file that if opened allows interference with systems on your computer. Attachments should not be opened unless you are very sure they are safe. Spam filters (special software) will identify some risky files but not all. Beware those websites that mimic those of official public services; the address ending shows that they are not genuine. The consequences of being victim to fraud are serious – distress, withdrawal, shame, loss of independence, spoilt quality of life. In order to help we are encouraged to watch for such changes in others who may have been victims without admitting their bad experience. Dale warned us to avoid identity theft. The fraudsters can piece together evidence from many sources that could give them access to your accounts. Personal information should never be disclosed when you did not make the approach. Dale recommended shredding sensitive papers. PC Sara Evinson related stories where the fraudster was so convincing, that they kept the victim on the phone for many hours while pretending to be police and continuing the fabricated story. In some cases a courier was sent to collect the bank credit card that needed to be changed. In another a taxi was sent for the victim to withdraw funds from his bank- but he met a friend who dissuaded him from complying with the fraudster’s plan. Thus older people being on their own can be at risk. We were relieved to hear that in at least one of these events the victim’s bank protected them against loss. Dale and Sara fielded many questions and then helped with the Raffle. There was an enthusiastic and crowded attendance. ‘Senior Citizen Coffee Morning’, ground floor Muswell Hill Library on the last Friday of each month. * Contact Janet if you wish to go with someone. Is Public Transport ‘Age Friendly’? How do we keep safe on the roads? Next meetings: Nov. 19th Dec 10th party. Many members may be eligible to be a member of Dial a Ride. This service is very helpful. Write to Dial a Ride, Passenger Services, PO Box 68799 London SE1P 4RD or phone 0343 222 7777 to request an application form.